Biceps tendonitis, also called bicipital tendonitits, is inflammation that causes pain in the front part of the shoulder or upper arm. 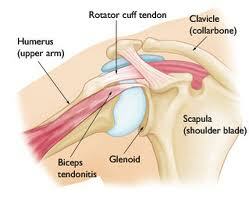 It occurs from overuse of the arm and shoulder or from an injury to the biceps tendon. Symptoms of biceps tendonitis include pain when moving the arm and shoulder, especially forward over the shoulder height. During this movement, pain is felt in the frontal region of the shoulder. Results from overuse microtrauma of the biceps tendon unit secondary to repetitive flexions and/or supination. Elevate arm frequently with compressive wraps. Any limitations that affect strength, range of motion, and general efficiency of upper arm, shoulder girdle, and upper back, including cervical and thoracic vertebrae. Successfully managed by the primary care physician but refractory cases may mandate a referral. The goal of rehabilitation is to return you to your sport or activity as soon as safely possible. Everyone recovers from biceps tendonitis injury at a different rate. In general, the longer you have symptoms before you start treatment, the longer it will take to get better. Biceps tendonitis can be prevented through proper warm up and stretching prior to activity.